Sometimes life just gets in the way and no matter how much you take care of yourself, you feel the beginnings of a cold coming on. This happened to me last week and with my arsenal of natural remedies, I jumped into action to clobber this cold before it took hold. At the first sign of symptoms, I took a mega dose of vitamin D3 (20,000 IU). The first thing in the morning, one hour before you eat anything, I took 6 capsules of Enriching Gifts Sterol Max. These powerful plant sterols ramp up the immune system to battle the cold. At breakfast, I took another mega dose of vitamin D3 along with my other supplements. Speaking of breakfast, you don't want to suppress your immune system with sugar and other processed foods but that's another story. Next I did a sinus flush, also called a sinus irrigation, with a mixture of distilled water and Enriching Gifts Colloidal Silver. If you haven't done anything like this before, it is basically sticking your nose in the solution and carefully inhaling until you can feel the solution running down your throat. One of those nose bulbs can also be used. I made sure that I was drinking fluids to help prevent dehydration and loosen mucus which there always to be more than enough of during a cold. I avoid caffeine products late in the day because I need to get plenty of rest. Rest provides the energy your body needs to fight illness. I also avoid blowing my nose to hard. You basically are applying back pressure when you blow to hard and end up forcing any infection further into your sinuses. Before bed, I performed another sinus flush. If I am having trouble sleeping I use natural products like Essential Source Sweet Dreams Strips or Oregon's Wild Harvest Passionflower. Another favorite is valerian root. Repeat this process the next day. Too often at the first sign of feeling better, we quit supplementing. Don't do it! 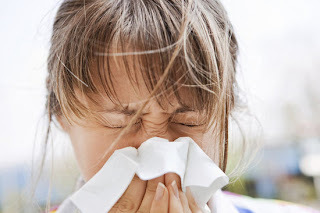 Colds are sneaky and will come back with a vengeance if it sees an opportunity. The following things have been clinically shown to shorten the duration or alleviate the symptoms of a respiratory infection. I take these regularly, but increase them when I feel a cold coming. And the cold? It never did develop into what is normally called a cold. Is the flu season really all that bad?